The last race of the summer series, the champagne is still flowing for the sailors at FFSC. 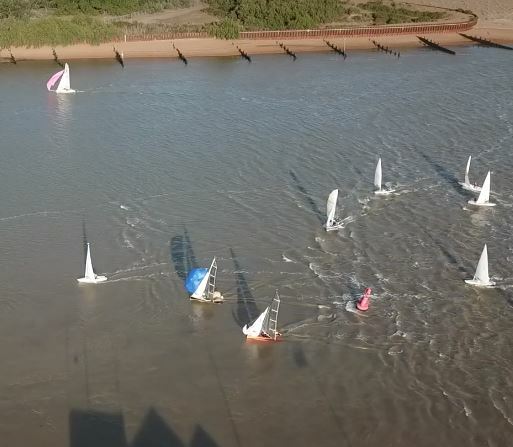 a 17knot southerly breeze and another Ebb tide left the race officer with an easy course of start line, Oystercatcher (p), Tug (p), Kingsfleet (p), Tug (s), Oystercatcher (s), line. 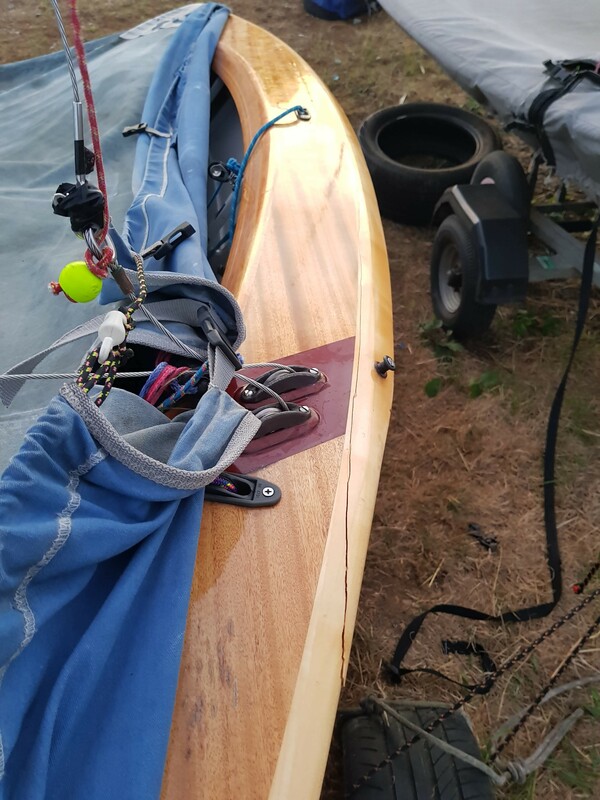 With Gnu still being re – rigged, Matt Read and Deception took the opportunity to bag national champion Ed Swain as helm for the last race of the series. They needed a good result to hold onto third or could they sneek 2nd? the series already won by John Daniels. As the fleet edged their way down horse sands Ed & Matt passed John and then Simon & Dan who then overtook them as they approached the gybe mark Oyster, with a couple of boat lengths lead Simon & Dan were first to gybe, a neat gybe, considering Dan was holding 3 bits of string (Ed’s note: we know you told it like that in the bar, but truthfully?) followed by a neat swim (Ed’s note: yeah, yeah, Dan was holding so much string you just had to swim right?). This saw Matt & Ed take the lead, followed by John, Rog & Debbie and T O’L. Ian Bolton gybed and swam and as Guy planed into view the gap between Ian and Simon was marginal and Guy too took the plunge, crashing into the capsized Storm Cloud. After righting the boat Simon & Dan set off to try and reduce the gap, Matt & Ed rounded Tug first with Rog & Debbie next, at this point it’s hard to say how many lasers retired, but i think next round was T O’L, at the back Simon & Dan had caught up Doug & Bev in the 2000 (ED note: a merlin rocket should not really have to catch up a 2000, unless it is a pursuit race; how long did you go swimming for?) rounding Tug just behind. The beat to Kingsfleet, was fairly straightforward, Ed & Matt rounded first hoisted and set off back to tug for the last time, next round Rog & Debbie who didn’t quite make it all the way round and a lazy bear away led to a instant swim, next round T O’L also decided that he was getting hot under the collar so a swim to bring the temperature down for him, this allowed Simon & Dan to round in 2nd and hoist. Rog & Debbie soon got the stick pointing in the air and hoist “the pink shocker” , out in front Ed & Matt turned Tug for the last time and headed for the Line, At tug Simon & Dan just held off Rog & Debbie to round next, foolowed bt the refreshed T O’L. The short fetch to oystercatcher saw the superior fitness of Simon & Dan (Ed’s note: what he is saying here folks is not fitness per se, the mathematics is this fitness pah! fitness = mass, Dan & Simon = heavy Rog & Debbie = Light. upwind in 17knots heavy =winner) pull out a nice lead over Rog & Debbie and that is how it stayed to the finish. Notable this time is that finally the teams are getting to grips with the string and rigs so extra applause please you lovers of Rockets, Ed & Matt won on handicap too! Very well sailed, if only you could get the same helm for every race…. here’s the results with series results too. Well done John Daniels winning with a race to spare. Welcome back to the Wired World of Sports…. Reverend Cleophus James: DO YOU SEE THE LIGHT? Jake: THE BAND! Reverend Cleophus James: DO YOU SEE THE LIGHT? Elwood: What light? Reverend Cleophus James: HAVE YOU SEEEEN THE LIGHT? Jake: YES! YES! JESUS H. TAP-DANCING CHRIST… I HAVE SEEN THE LIGHT!